Am interested in finding any builders or others investigating the Francois Lucas "Mini CP" design. Only one in build, maybe more investigating. Not any in NA that I know of. Currently 3 active Dudley Dix Didi Mini builds and 2 on again / off again builds. Do you have contact info for the CP build you mention? If you feel you cannot post it, would you pass my email along to them please. PS - I have inquired (twice) to Lucas for info on the MiniCp but receive no reply. Do you know of any problems they are having that may be keeping them quiet? I've been looking at the design, have emailed them and received a great deal of information. I would say that they are very responsive. I hope everyone recognizes my self-interest here. Two actually - to sell Minis & to get the North American fleets racing asap. Unless you have excellent woodworking skills you probably cannot build the boat in 800 hrs. Sam, Dave & some others have been keeping a good record of build hrs & construction costs - so my guesstimates can soon be replaced with some firm numbers. In addition to the plans & kit parts/materials, how much do the other items cost - stern hatch, opening ports, keel bulb, epoxy, paint, tools, sanders, saws, replaceable bits & pieces including blades etc? What is the real budget beyond labour? In my case: I would improve my skills over the length of the project but would likely hate to see my mistakes & poor workmanship, I can make more than $25.00 per hr, I want a competitve Series boat rather than a non-comp. proto. & I want a boat asap, not 2 years from now. SC2 kit boat - deck, hull, keel & bulb, stanchions, pulpit & pushpits, rudders, tiller, stern hatch, 2 opening ports, delivered on the East coast = $30k. This $30k is the important number - a kit boat & a home built woody will need the same budget for gear & rig to finish them & sail away. Is "Build 'em for love not to save money" the best advice? Adrian, nothing beats the feeling of your own build boat sailing for the first time, and i know as boat builder. In Holland hundreds of homebuild plywood boats sail around with a lot of satisfaction, and for more then 20 yrs. This MIniCp will never be build in the numbers like the series, will be a niche. More potential prototype builders that want to have an easier way. Oh and if you impregnate every side (including with aceton diluted epoxy for the ¨head¨side of the sheets) you will be fine. But arranging the foil and bulb can be tough. I have looked into both the Mini CP and Dix Didi Mini. I am a boat builder in Ft. Lauderdale, so the idea of a home built boat isn't completely out of the question for me. I have budgeted out the estimated cost to put a Mini CP on the water fully equiped to race. It is right in the $55K to $60K range, with the variable pricing in spars, sail material, and electronics. For $60K you end up with a carbon rig and spars, high end electronics, and laminate sails. The hull itself can be built for around $12K, including the CNC work for the frames. With my resources and skill level I still consider the build to be upwards of 1200 hours. It would be possible to finish the hull in 800 hours, but there would be a lot of time in hardware positioning, rig placement, etc that i don't think is considered in the designer's time forecast. That being said, the SC2 from NAMT is a much better deal for the cost. I don't think an undertaking such as building a boat is about the money, though. The satisfaction of shoving off the dock in a boat of your construction is incomparable to any other. As for wood boats, Columbus got here on one, so I'm not terribly worried about the material choice. So build one or buy one, I'm still trying to decide which path to take for my first mini. Man, given you location, it's a shame that the M65 is not moving faster. A hull/deck kit from them would be the best bang for your buck for sure. 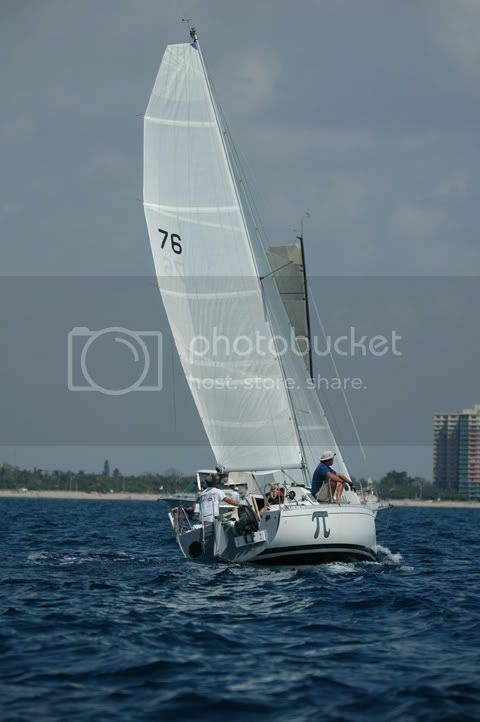 I've traded e-mail, phone calls, even chased Jeffrey down at Miami Strictly Sail. I was all set to put down a prebuild deposit, but he didn't have anything but the plugs finished. Vectorworks, who made the plugs, also made the hull and deck forms for our company's 51' motor boat. I even took a drive to see them in Titusville. I just don't see the project moving forward with any efficiency or hope of completion of hull #1 any time soon. Hell, I wanted the plugs to form my own molds. Needless to say, I haven't seen or heard anything from him in a while. Could have been a great thing but I have fears it may go the way of the TamTam. I wish him the best of luck and I hope to see a boat from him eventually, but I want to own one a little sooner than that. I just got e-mail back from Lucas about the MiniCP. $2453.00USD buys the files, plans, and cnc programing. Lucas does not sell study plans for 150$ or so. One hand that is a pity, you really can see a lot on them. M65 is deadly quiet, Jeff normally emailed me progress, but now... nothing. I asked Lucas about the study plan thing. His reasoning is exactly that, no poorly built knock-offs claiming to be his design. It would be nice to see all the specs on the hull prior to commiting to the build. I would go for it, 231 is still sailing and was fast in its time.